The present report shows that a safely reduction (germ killing) of Salmonella of dry products can be archieved with the KREYENBORG FS-IRD. 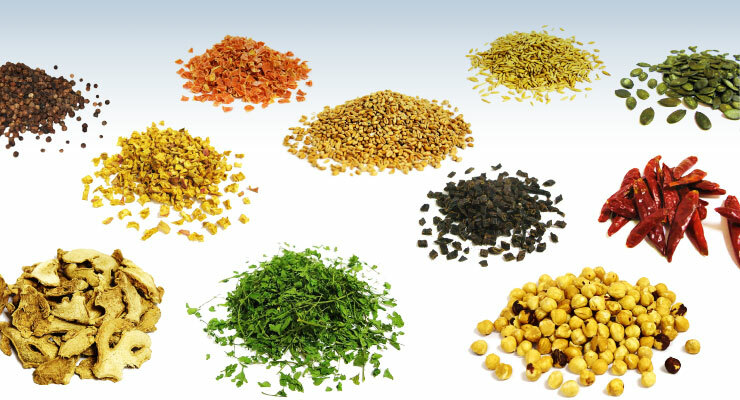 Press release K2016: Drying, Storing, Mixing, Conveying and Dosing. 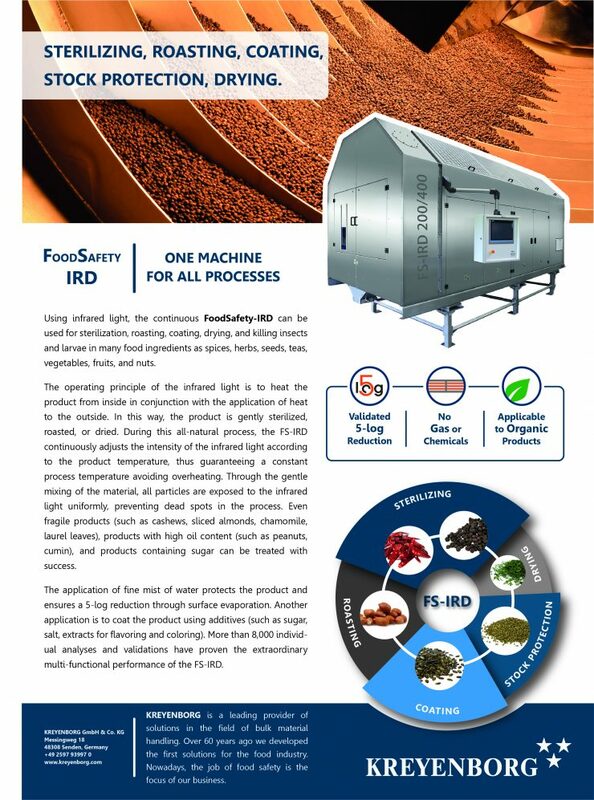 On the occasion of the K2016 in Düsseldorf, Germany, KREYENBORG Plant Technology GmbH, based in Senden, in northwestern Germany’s Münsterland region, will be presenting information regarding their wide assortment of efficient bulk material handling in the plastic-, food- and chemical industries. Particular focus this year will be on the range of topics regarding drying and crystallizing, as well as comprehensive solutions for bulk-material handling processes. 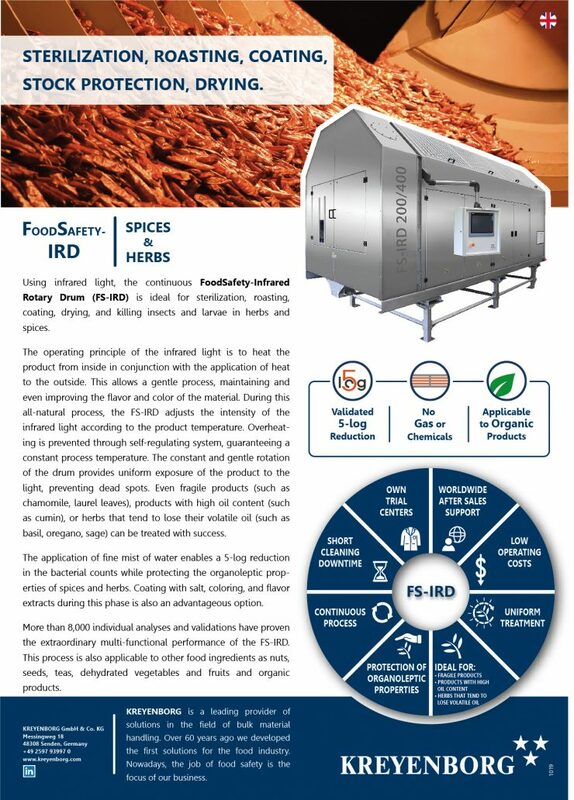 OVER the past three years, KREYENBORG, in partnership with PS Perfect Solution, has developed a technology for germ reduction, drying, protective treatment of stocks, and roasting and toasting of foodstuffs. 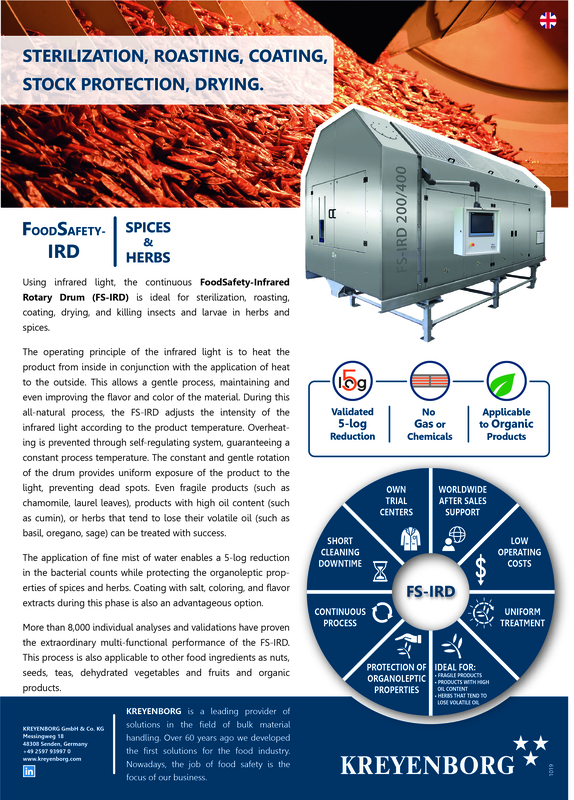 The two companies have combined competencies from 60 years of machine manufacturing and 30 years of food processing technology to develop the FoodSafety-IRD. Imagine, you have a mixture containing sugar or salt which has to be re-dried. Or you have a mix of fruit (e.g. sun-dried berries) which has too much residual moisture. Or, imagine you have a smaller batch of goods for which it is not worthwhile to turn on a drying facility. For those and other problems the KREYENBORG Infrared Drum IRD is made.